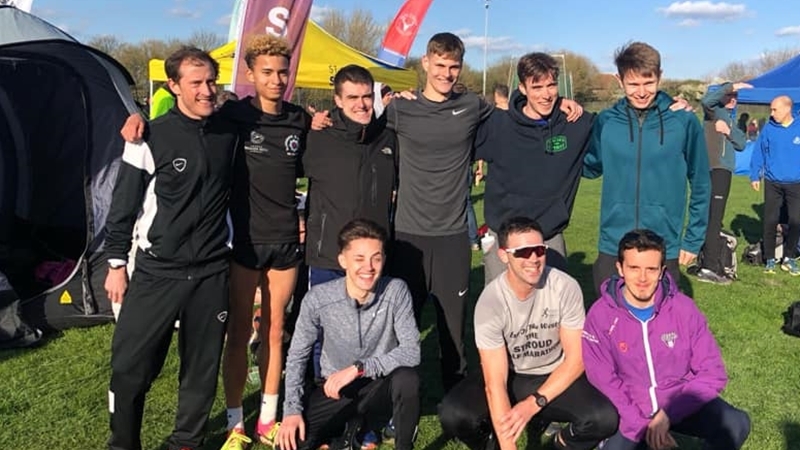 So yesterday saw 12 of Blackheath and Bromley's finest athletes head up to the more Northern parts of the South of England for the SEAA 12 Stage Relays. It was with great relief that 10 of the 12 were at the course prior to the 1st leg. Something that was a pleasant surprise to the team management and a theme that continued in to the race. 1st leg was undertaken by Will Fuller who made the declaration prior to the start that he had 'forgotten how to race'. A quick instruction from team management that it was left foot, right foot repeat was well received as he came storming back in to the track in 1st place. The 6th fastest long leg of the day. Off set Lewis Mills and despite the fear and instruction of the team management to not go off to fast and manage his effort for the whole leg he flew off but came back flying as well still in first place and 8th fastest short leg. Next up was Josh Schofield who went off in first place but with a number of clubs breathing down his neck. He managed to return to the track in third but put in an early showing for what is to come for the summer season as he managed to use the last lap of the track to full effect and get the team back in to 2nd place. The unenviable job of taking over in this lofty position fell to Marco Arcuri but he really dug in and stuck to the task well to keep the team well up pecking order in 7th. Alex Bruce-Littlewood then took on the next long leg and found himself in quite the fight with a lot of teams in and around him. It was this fact that left the team managers delighted to see him back on the track in a strong 10th place just ahead of the half way stage. This half way stage leg was for the ever on the come back trail Will Ruiz and he would have fooled most people that he hasn't been running as he climbed to 9th. The ever green Alex Gibbins had the next long leg and whilst he might have dragged the average age of the team up a bit he did nothing to drag the team down and came back with the team still in the top 10. Even Danny Brewer had arrived with enough time to not panic everyone and despite his skin tight short being rather baggy. (To the point where Tom Desborough's purple shorts might have been a better option), he put in a strong leg for 12th place but most importantly in the mix with those in front and building distance on those behind. Fresh from a self designed warm weather training camp and with nearly 100 miles in the legs and a questionable tan Ross Braden had the next leg and pulled us back in to 10th place. 10th leg was left to team manager/uber driver/U23 day care provider Chris Tuck and despite a lack of form, training and a whole host of other excuses managed to hold us in 10th even with the slowest team leg of the day. 11th leg went to Charlie 'tempo run' Davis whose version of a tempo run was still at least 20 secs quicker than the leg in front of him. Holding us in 10th place and a minute lead on 11th. 12th and final leg went to Callum Myatt making his senior team debut. He did not let the fact he had had to wait all day for his leg and worked hard on what is a very lonely leg to bring the team across the line in 10th place. 1 minute 30 secs ahead of the chasers. This is as far as we can tell the best finish we have managed at these Championships since 2005 when we finished in 9th. So a great effort and with such a large part of the team at the lower end of the senior men age bracket this is something that we can look to improve on in the coming years. The first step to build on this is the National 12 Stage which we have qualified for in two weeks time on Saturday 6th April. Could we please ask that everyone regardless of weather you ran on the weekend let us know of your availability so that we can try and pick the strongest possible team to try and turn our highest Southerns position in a number of years to a highest National finish. Please note that anyone 17, 18 or 19 on 31st August 2018 can run in the senior team for this event.